RAF control from 1941 as training base. Refurbished for RAF operational use, April 1942. & Mosquito's of 51 Operational Training Unit. March 1943 additional RAF Mustangs from Nos 164, 169, 239, 208 engaged in operation Spartan. The last grand scale air exercise before D-Day. During my time at Twinwood it was a comparatively small outfit, but I have no knowledge of the changes made when it was transferred over to USA control. 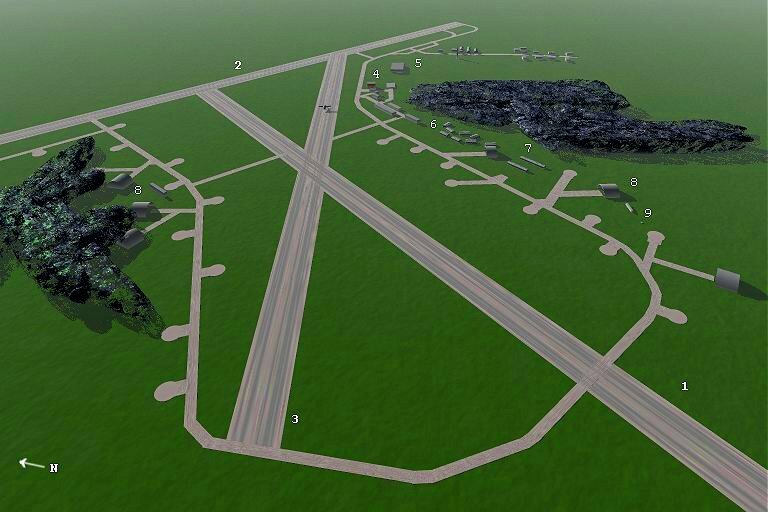 Then the place may have been enlarged and new buildings added, also many of the old ones modified for other uses. There was a considerable merger of US and UK forces even before this period and I suggest that the single engine planes could well have been stored at the far side of the runways. They certainly did not fly or have any aircrew while I was on site. Initially we had Beaufighters, then we had Mosquitos up to the time when I left for TRE and Fighter Command HQ. During the entire time I was there only 51 OTU occupied the airfield. As I remember it the entrance to the camp was a road coming off the main road to Bedford, that eventually ended at the perimeter track. Mess hall, showers and living accommodation, (Nissen Huts) were located on both sides of this road. On reaching the perimeter track I turned left along a smaller road with huts on both side and the control tower immediately ahead, total length a few hundred yards. On the right hand side of this road was a very large nissen hut that contained the HQ offices and on the road side was the entrance to the RADAR section that occupied about a quarter of the hut in one room about 20 by 40 feet. The workshop was heated by a coal stove that was also used to heat the evening meal for the mechanic on duty. Because this was the site for the radar using the then highly secret "magnetron", the workshop had to be manned night and day and we took it in turns to sleep there, with a loaded machine gun beside the cot. On the opposite side of the road were other huts (possibly part of a fuel dump) Please remember that none of us experienced much more than the immediate surroundings that we worked in. All our major maintenance was done at Cranfied (a few miles south) so I saw little except the road with the control tower and the main HQ building with the radar workshop. I saw no single engined fighter that was operational during my tour of duty, in fact during my stay I saw nothing except night fighters, beginning with the Blenheim, then the Beaufighter and finally with the introduction of the MK 10 centimetric radar the Mosquito. As I have shown on the map, all of the living accommodation was on the sides of the entry road. Most, that is the main dining hall, officers huts, showers and a small NAAFI were on the left going up the hill towards the perimeter track. Most of the mens accommodation was on the right side. When I was there we had very few WAAFS and I cannot remember where they lived, could very well have been down towards the Bedford road. The HQ building, a large Nissen hut was as shown on the map, between the road and the perimeter track. At the Tower end was the CO's office and other administration offices and behind was the RADAR section and some other admin offices. Other than the one or two other huts on the opposite side of the road to the HQ building there were few if any more buildings. 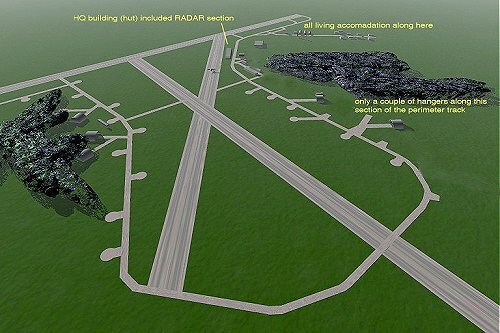 The 1944 radar buildings with the directional sweep suggests that it was a ground based radar for monitoring the airfield traffic. Such things just did not exist when I was in the service and were implemented after the end of the war in Europe. The RADAR Section I mention was merely a workshop where we could store the classified equipment, work on defective sets and use as our base for all the work on the aircraft. I suggest that as I have found out from other govt documents, the recording of WW2 was not of much importance during the first few years of WW2, after all there were more important things to concern us. However as the war progressed several voices began to ask that these things be recorded. As I mentioned, during my days at Twinwood farm this was a very small adjunct to Cranfield and was looked on as just another squadron further down the road rather than a separate base. The number of people and planes was quite small, usually just one squadron. This of course is what I am recording. Later when the US forces took over I know it became a close partner to the nearest US base (Thurleigh). At this time I suggest that considerable expansion took place which was incorporated into the final overall description of the base and much of the original days was forgotten.